A well loved classic! We've lightened up this truly indulgent dessert which would normally use mascarpone cheese. 1. Dissolve the coffee granules in 2tbsp boiling water. Tip into a large shallow dish with the coffee liqueur and the cold water. Mix together. 2. Beat the cream cheese with the condensed milk and vanilla. 3. Dip one sponge finger into the coffee mixture until soaked. Break the sponge into the bottom of one of the glasses. Top with a generous spoonful of the creamy mixture and a generous sprinkling of cocoa. Repeat the layers once more, finishing with the cocoa dusting. Use the remaining mixture to fill the other 3 glasses. Chill for at least 1 hour before serving. You could make one large Tiramisu and serve with some fresh peaches and raspberries. Tiramisu is rated 5.0 out of 5 by 2. Rated 5 out of 5 by Floss from Great and simple! I needed something easy to make as a dessert in Spain. I really struggled to find fresh cream so thought I'd try the Carnation website. This recipe was really easy and I made it in a large dish. I had to substitute Amaretto as I couldn't find coffee liqueur either but worked great! 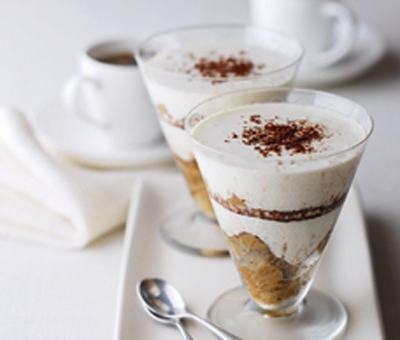 Rated 5 out of 5 by Zari26 from Very easy and delicious Tried out this recipe and have to say it was even moRe delicious than the original Tiramisu recipe . And too easy to make as well . A real winner ! !